The group Elphinstone Logging Focus has been raising the alarm over plans by BC Timber Sales to auction cut-blocks in the McNeill Lake area near Madeira Park, including three within the watershed that supplies one of the Sunshine Coast Regional District's systems. The SCRD's Planning Committee was looking at that and BCTS auctions in the Homesite Creek area at their Jan. 17th meeting. As well as airing concerns about the potential impact on the water supply, Directors and staff say they're growing increasingly frustrated with a lack of timely information from BCTS. Planner Teresa Fortin told the Committee staff are asking the Board to request a meeting with the minister, because the usual lines of communication seem to have broken down. "We have asked BC Timber Sales in the past, and the (Ministry of) Forests District Manager to improve our communication and that seems to have not gone anywhere, so I think they need to have direction from the minister." Area A Director Frank Mauro praised the efforts of ELF in bringing the issue to their attention, but also decried the need saying, "It's got to be time for us to have to stop posting a sentry on top of the hill to warn us what's going on. We have to have a communication protocol (with BCTS). I cannot possibly make a stronger comment." It's not clear how much success the SCRD might have in an approach to the minister. At that same committee meeting they reviewed a letter from Steve Thomson rejecting the idea of a comprehensive land use plan for Mount Elphinstone, the site of controversy in the past few months over logging by the Sunshine Coast Community Forest. Elphinstone Logging Focus (ELF) is raising concerns over a plan to log a portion of the McNeill Lake watershed south of Madeira Park, but B.C. Timber Sales (BCTS) said the proposed harvest has been in its operating plan since 2008 and will not alter water quantity or flow in Haslam Creek. On Jan. 15, ELF issued a news release saying BCTS was planning to “log an area of 42.4 hectares directly in the McNeill Lake community watershed,” which provides the source of potable water for about 2,300 residents in the Madeira Park and Frances Peninsula areas. However, when contacted by Coast Reporter, BCTS said only 10.8 hectares will be logged in the community watershed under its harvesting plan, while two other cutblocks spanning about 22 hectares are situated outside the watershed. “Wildlife tree retention areas covering 7.5 hectares are linked to the proposed 10.8-hectare harvest area — an amount well in excess of the legislated retention requirement of 10 per cent,” BCTS said in a written response. BCTS is currently advertising a timber sale in the Haslam Creek/McNeill Lake area, with Feb. 7 set as the closing date for tender submissions. Consultations with Sechelt First Nation began last summer and were concluded last month, BCTS said in its response, adding that its forest stewardship plan was approved on April 1, 2012, following consultation with the public, First Nations and the Sunshine Coast Regional District (SCRD). • The Haslam Creek/McNeill Lake watershed comprises more than 1,600 hectares, with the 10.8 hectares proposed for harvesting in the community watershed representing less than one per cent of the total forested area. Regarding the economic return, BCTS confirmed that the upset stumpage rate is $20.39 per cubic metre, but said it expects higher bids will be received. 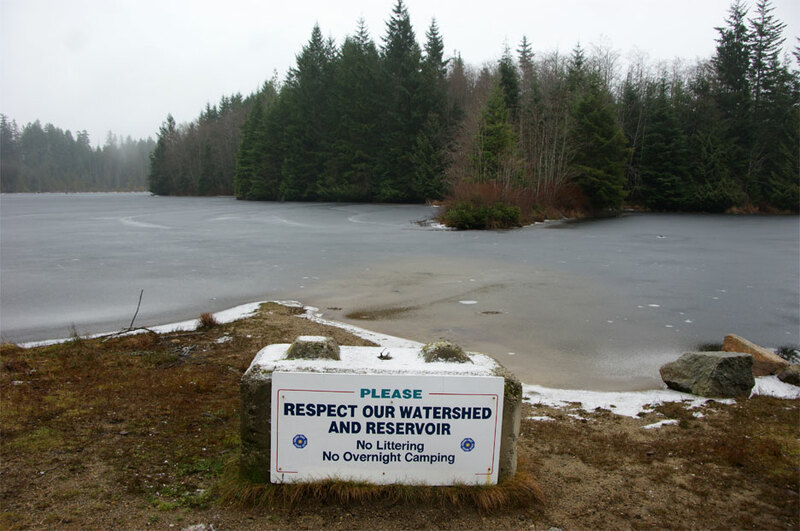 Since the SCRD assumed ownership and operation of the South Pender Harbour water system in 2008, ELF is asking the SCRD to hold an emergency meeting in Pender Harbour to discuss the proposed logging in the watershed. SCRD staff contacted Jan. 15 said they had just been made aware of BCTS’s harvesting plans and were still in the information-gathering stage. Contacted Jan. 16, ELF’s Ross Muirhead said the SCRD’s reaction proved that BCTS did not properly consult the public. “Our main point is that there wasn’t adequate consultation, from the SCRD down to the water users in the area,” Muirhead said. On the discrepancy between ELF’s and BCTS’s figures for the proposed size of the cut within the watershed, Muirhead said ELF based its number on the BCTS harvest plan. “I have to conclude that what you were told by BCTS is questionable and contains spin,” Muirhead said. The Sunshine Coast Regional District (SCRD) is calling for B.C. Timber Sales (BCTS) to immediately cancel its plans to allow logging within the McNeill Lake watershed. The board is also asking Forests, Lands and Natural Resource Operations Minister Steve Thomson to address two long-standing issues — why BCTS consistently fails to notify the regional district of timber sales within the SCRD, and why the board’s objection since 2000 to harvesting in community watersheds has been ignored. “I want to voice extreme concern about the process with BCTS,” Pender Harbour/Egmont director Frank Mauro said at the Jan. 17 SCRD planning and development committee meeting. With McNeill Lake/Haslam Creek serving as a community watershed for more than one thousand homes, Mauro said he found it “distressing” that there was no consultation with the SCRD before the cutblocks went on sale. “These non-consultative methods that they’ve employed make it extremely difficult, even for people who support a reasonable, productive forest industry, such as myself, to remain supportive,” Mauro said. Directors gave special urgency to their resolution, bypassing the normal board ratification process so that staff could take immediate action. At the meeting, planning staff said they had found no background paperwork on the proposed timber sale, which had been publicized days earlier by the environmental group Elphinstone Logging Focus (ELF). “It took us a little by surprise,” planner Teresa Fortin said. Thanking Ross Muirhead of ELF for alerting the SCRD to the timber sale, Mauro said it’s time for BCTS to get serious about following a communications protocol. “We can’t keep posting a sentry on top of the hill to warn us what’s going on,” Mauro said. BCTS, however, told Coast Reporter — for the second time in two weeks — that consultation with the SCRD had taken place before its forest stewardship plan was approved on April 1, 2012. In its response, BCTS said it “will be proceeding with the McNeill Lake timber sale,” noting the auction date is Feb. 7. The proposed cutting area for the timber sale spans 32.8 hectares, but BCTS said only three small cutblocks covering 10.8 hectares lie within the watershed. McNeill Lake was heavily impacted in the 1970s when the outlet on the lake was dammed, BCTS said. SCRD staff reported at the Jan. 17 meeting that one cutblock corner lies within 50 metres of McNeill Lake, but BCTS said the boundaries of the timber sale area were not set arbitrarily. Also at the Jan. 17 SCRD meeting, directors passed a second motion to be acted on immediately by staff, informing BCTS of concerns over a proposed timber sale in Halfmoon Bay near Homesite Creek, as the site is adjacent to the Suncoaster Trail and an SCRD water tank. Homesite Creek, Halfmoon Bay director Garry Nohr pointed out, is a growing recreation area with recently built campsite amenities, and plans for a future expansion of the Suncoaster Trail are also in the works. Directors invited Mark Anderson, Sunshine Coast district manager for Forests, Lands and Natural Resource Operations, to next month’s planning and development committee meeting to respond to the SCRD’s concerns over the two timber sales.